2016 has been a year of revival for Hyundai. Not in the business sense of course, every passing year has been a bigger success for the brand and it's poised to breach the half million sales mark this year. By revival, we mean that the company's two big launches in 2016 are in segments that have been struggling off late. First came the Elantra in a segment where only the Octavia and Corolla sell in small numbers. Now, we have the all new Tucson which will go against just one direct competitor, the Honda CR-V. The other direct rivals, the Chevrolet Captiva and Renault Koleos have been discontinued. 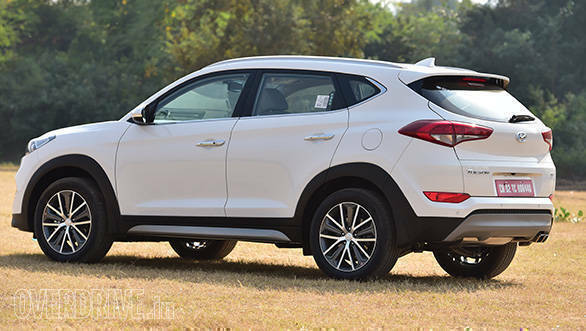 The new Hyundai Tucson aims at reigniting interest in this price point with Hyundai's trademark offering of good performance, plenty of features, solid safety and great design. Hyundai has really outdone itself in the design department - the Tucson is the most handsome sibling in a family of good looking SUVs. Every profile looks great, starting with the striking face. 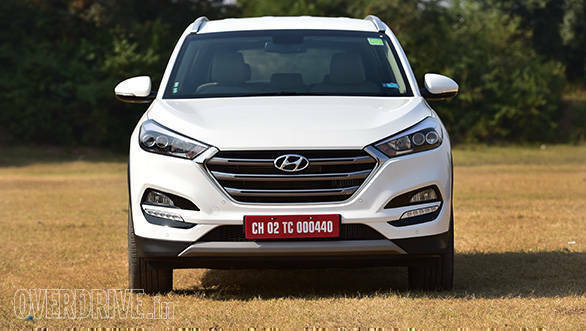 Hyundai has made clever use of sleek pulled back headlamps that straddle an imposing new chrome grille. The lights feature dual LED projectors while LED DRLs and fog lamps are neatly incorporated in the front bumpers in a smart gloss black section. The side profile is really interesting too thanks to an unusual asymmetric shape in the wheel arch moulding and a single shoulder line. Black cladding all around gives the Tucson some SUV presence and the 18-inch diamond cut wheels catch the eye. The roof gets subtle silver finished rails and there's a shark fin antenna shared with the Creta. The rear section has a subtle but sporty protrusion in the bootlid, sleek wrap-around lights and a chrome dual exhaust on the right. What I love most is the Tuscon's athletic stance thanks to the pronounced boot, smart spoiler, pinched window line and kinked wheel arches. It looks crouched, ready to pounce. Excellent job on the exterior Hyundai! The cabin meanwhile looks like a grown up, wider and more plush version of the Creta. There's a large eight-inch central touch screen display with crisper graphics and a neater interface than the Creta. The system is quite easy to understand and navigate but menus open with a slight delay after pressing the on-screen buttons. 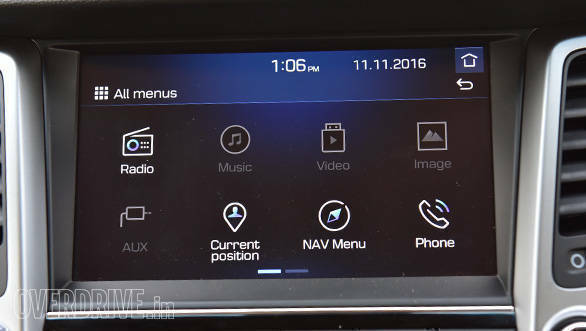 The system supports both Apple CarPlay and Android Auto. The audio system pumps out great sound, crisp, clear and powerful. Below the infotainment screen and its row of buttons lies a two zone climate control system with a cluster ioniser air purifier system, a point now worth mentioning given the poison we big city dwellers breathe. Stowage spaces are plentiful with two cupholders up front and a bottle holder in each door. The central armrest also conceals a large compartment and the glovebox is cooled. Behind the gear shift lever in this automatic variant is an electronic hand brake button, an auto hold button and separate buttons for the parking sensors and hill descent control. The diesel automatic has two drive modes and the button for these resides here as well. The power window switches get classy with a new chrome strip at the edge but it's disappointing to see only the driver gets an auto up/down function. The instrument cluster uses familiar analogue dials that flank a colour MID. Interestingly, Hyundai isn't offering a sunroof. I personally approve - aside from making the AC work harder, sunroofs are weak points that eventually start to rattle or leak on our roads. But I assume the type of buyers who enjoy sticking their heads out for a lungfull of our lovely big city air won't be pleased. Connectivity options are good with two 12v power sockets on either side of USB and AUX ports. There's another 12v socket in the luggage compartment but rear passengers don't get one. They do, however, get dual air vents. The Tucson in this top GLS trim is loaded with kit. The seats are leather wrapped with powered controls (including lumbar) for the driver. The inside rear view mirror is auto dimming and features a digital compass while the electrically folding ORVMs have a segment first heating function to keep them clear in cold conditions. There's the now expected suite of cruise control, auto headlamps and wipers, but there are also a few brand new features at this price point. The tailgate for example is electrically operated and can be opened from outside or by using a button positioned to the right of the steering wheel. It also has a smart-open feature that detects if the key is nearby for more than three seconds and opens the boot while sounding an alarm and flashing the hazard lights. Helpful if your hands are full and the key in in your pocket. Boosting rear comfort, the 60/40 split folding rear seats are adjustable for recline as well. The cabin is roomy with generous space at the rear for the knees and heads of tall passengers. Boot space is good for a family holiday and has retractable hooks and tethers to strap luggage down. It also comes with a retractable cover on top and conceals a full sized spare tyre beneath. Overall, fit and finish is great and Hyundai only seems to up their quality game with each new product. Hyundai offers two engines and two gearboxes. The 2.0-litre petrol is the same motor from the Elantra but in a higher state of tune (155PS compared to 152PS) and comes with either a six-speed manual or automatic. However, the more exciting news is the new 2.0-litre turbo diesel that also offers the same choice of manual and automatic gearboxes. 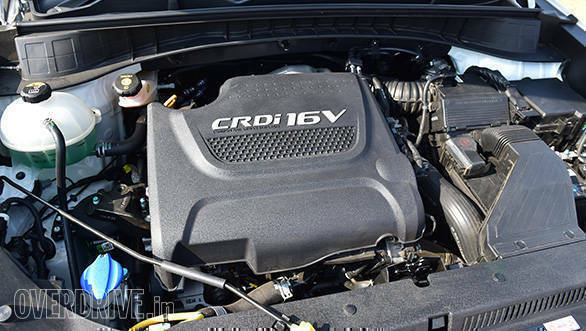 Given how creamy smooth and linear Hyundai's current diesels are, expectations are high. Initial impressions are good with 185PS and 400Nm, numbers right up there with European motors in more expensive machines. Push the start button and you'll notice that the engine sounds a little louder than the 1.6-litre Hyundai diesel from the outside. However, excellent sound deadening ensures things stay smooth and relatively quiet in the cabin when the doors are shut. The engine offers a linear power spread and is decently free-revving but I found no need to cross 4,000rpm, riding the large wave of torque is the way to go. We drove the six-speed torque converter automatic and discovered an able and willing partner but not the fastest unit out there. Shifts are quite quick and seamless but the gearbox takes a tiny moment to respond to inputs on the throttle when the vehicle is coasting. This is because it is eager to drop revs to idle when the driver lifts off the throttle. The act of the gearbox re-engaging when the driver gets back on the accelerator is what causes the delay. It's a fuel saving measure that persists in both Eco and Sport mode. Elaborating on the two modes, Eco dulls throttle response and encourages the gearbox to shift up early early while Sport offers sharper responses to inputs from the right foot and ensures the gearbox holds gears longer. There are no paddle shifters but manual shifting is possible through the gear selector. The manuals don't get these modes but instead offer adjustment for steering weight, called Flex Steer. The Tucson rides exceptionally well and there's a distinct European feel to the damping as the vehicle glides over smooth roads. The overall impression is an impressive balance between suppleness and controlled body movement. Body roll in corners is well restrained and bumps are absorbed well, albeit with a hint more firmness from the independent rear suspension. 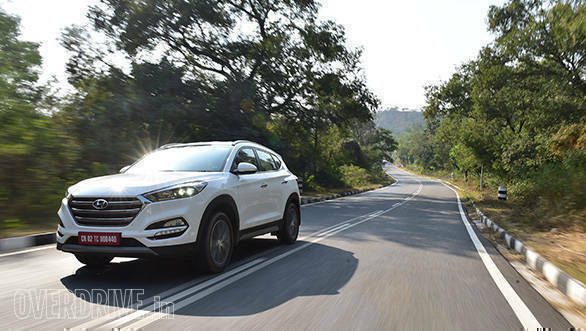 We didn't get to sample the Tucson on a very winding road but the initial impression of the chassis is of great comfort and confident dynamics. The brakes, discs all around, remind of the Elantra in terms of feel. Performance is perfectly up to the job but the pedal demands a firm push for quick reduction of speed. 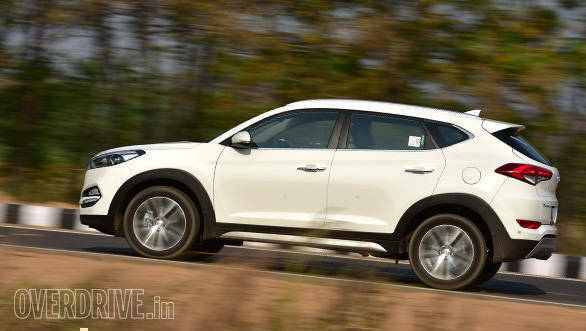 The Tucson is available only in front wheel drive in India, with the AWD variant expected by April 2017. Hard acceleration in first gear causes some wheelspin and a bit of torque steer, but traction control reigns it in. You can tell that Hyundai has been listening to feedback on the steering feel of its vehicles and efforts have been made to improve it. The electrically assisted unit doesn't have the ultra light feel of its younger siblings and is quite well weighted. It's a step forward but there's still room for improvement and the weighting as you turn the steering wheel still feels artificially generated and occasionally inconsistent. 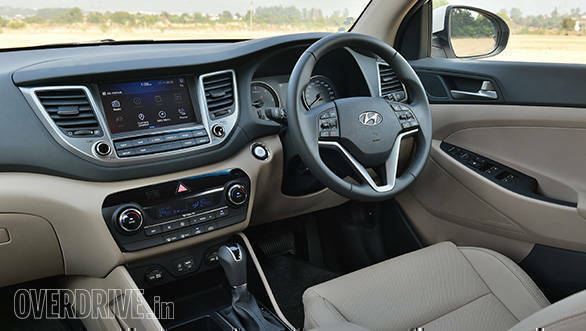 Overall, the Tucson is a very comfortable car to be seated in and a rather easy one to drive. 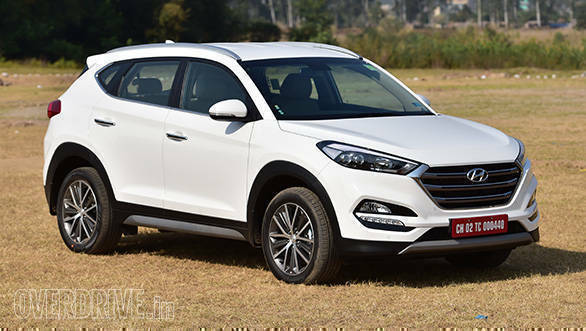 Fans of the SUV experience will be happy to note that the driving position (172mm ground clearance) feels more commanding than the Creta and the Tucson feels taller, wider and more imposing. Ultimately, as with the Creta, the priority tilts towards comfort rather than driving excitement. Safety is a very strong point. The Tucson offers six airbags, ABS with EBD, hill-hold and hill descent control. There's also front and rear parking sensors, impact sensing auto door-unlock, a reverse camera, height adjustable front seat belts and a roof-mounted three-point seat belt for the middle passenger at the rear. Another neat feature is the pivot on the rear side seat belts that allows the belt to exit the C pillar at different angles for different sized passengers. Extra thought has gone into making a small recess in the middle seat so the seat belt buckle can be neatly tucked in if not in use. Safety also comes from the body structure which uses 51 percent advanced high strength steels that promise better rigidity, longevity and NVH levels. In 2015, all this helped the Tucson score a five star Euro NCAP rating. 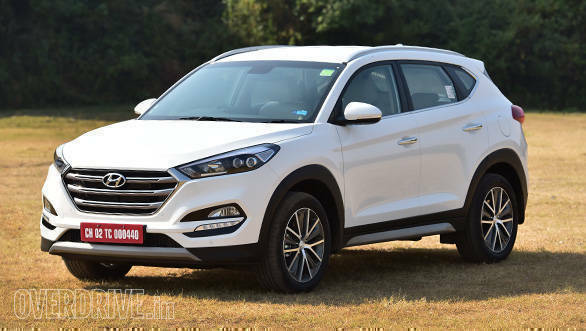 Hyundai has priced the Tucson well. Prices start at Rs 18.99 lakh (all prices ex-Delhi) for the petrol manual and extend to Rs 24.99 lakh for the top GLS diesel automatic. Crucially, this pricing slots the Tucson below the Rs 26.4 lakh Honda CR-V 2.4-litre AT, although the Honda offers all-wheel drive. Essentially, you get all the Hyundai strong points mentioned at the start of this review at a competitive price. Given that there's no direct diesel competition - the Innova Crysta is priced considerably below and larger rivals like the Toyota Fortuner and Ford Endeavor operate well above, I believe Hyundai is in for a another success story.